This annual crafty celebration has gotten darker and darker since I first attended in 2007. My favorite dandy (and Daddy of Disko Nouveaux) Wren Britton was there selling his exquisite Purevile! accessories, but there were also other artists that caught my eye. 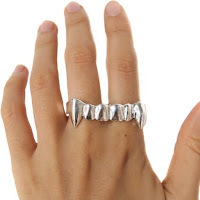 I fell immediately in lust with Verameat's designs - particularly this vampire fang double duster ring, which I snatched up post haste. 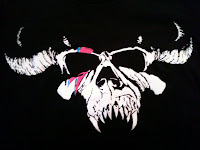 Not only does it have a killer look, but apparently it squeezes certain relaxation-inducing pressure points. 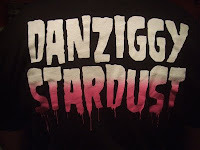 Then there was the ever-so-clever "Danziggy Stardust" tee by Jinxed Philadelphia, an irresistible twist with Aladdin Sane's lightning bolt emblazed on Danzig's horned skull logo. 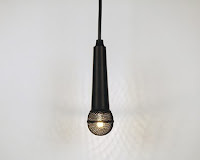 And finally, the ultimate RnR perversion of form and function - this microphone brilliantly reappropriated as a floor lamp (if you include the additional mic stand) by Re-Surface Design. Crafty indeed.